When it comes to choosing gadgets for the home, the old proverb ‘less is more’ always rings true. Here is a look at 5 of the best tech devices that use minimalism to make life easier. Tablets come with a long list of benefits for the home; from educational apps to communication via Skype. A tablet is perfect for syncing all of your home remote controls together and coordinating your devices via infra-red technology. This will keep your coffee table clear of clutter and remove the need to constantly search for your remote control behind sofa cushions. Modern cookers will come with an easy to read temperature dial on the front panel. Some may even offer a digital display. However, many people still worry about discrepancies between the recorded temperature and the actual amount of heat being generated. An oven thermometer is the perfect gadget for this and was even listed in The Independent’s 50 Best Kitchen Gadgets. The thermometer is placed inside the oven (either stood on the shelf or hung on the inner wall) and provides an accurate reading for your convenience. There’s nothing more frustrating than trying to measure a tiny spoonful of icing sugar or liquid on full-sized kitchen scales or measuring implements. 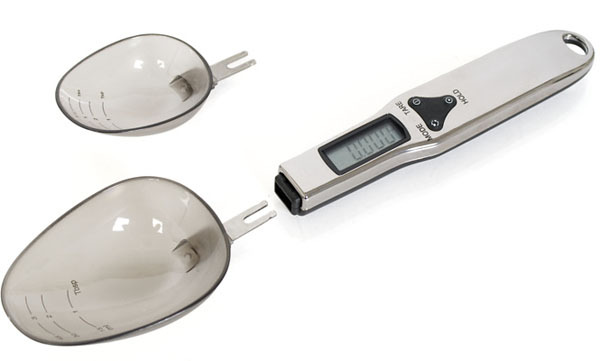 The digital measuring spoon removes this hassle and can let you measure granules, liquids and powders with complete accuracy for easier food-preparation. Instead of changing your bedding between seasons this device lets you cool or heat your bedding as needed. It’s also great if one partner likes things a bit toastier on their side of the bed. Portable mounts are a great example of simplistic design which makes life easier. Attach your tablet to your fridge while you’re cooking or mount it to the back of your car seat to keep little ones entertained on a long car trip – the possibilities are endless.